Mo’s Irish Pub celebrates halfway to Saint Patrick days with a party. 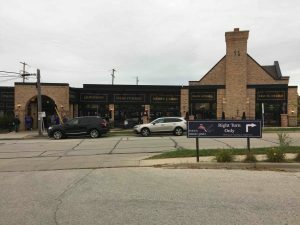 On Saturday the 15th Mo’s had an annual celebration in the greater Milwaukee area.The event lasted from 11a.m. to 2 a.m. The celebration had free shots of Guinness, engraved glasses and real Irish dancers. The Irish dancers dressed in the typical Irish garb and the traditional curly hair. The Irish dancing was lively and very loud. The noise made by the dancers feet echoed in Mo’s loud room. The dancing only lasted 20 minutes. women who was engraving the Glasses said “ It is halfway to Saint Patricks Day and everyone should get a glass. This job is one of my fav writes that I am able to do here at Mo’s.” She continued by saying “ Mo’s is one of the best Irish bars in Wisconsin you really feel with all that is going on that you are transported to Ireland.